It is not uncommon for someone to claim that their vehicle experienced an "unanticipated acceleration" or "sudden acceleration" (S/A). Despite having looked at many cars thusly accused, I have yet to personally find support for such claims. Though one German car maker may come to mind as a result of much bad publicity about this issue in the 80's, an internet search on the words "sudden" and "acceleration" will bring up pages alleging the problem has occurred in vehicles manufactured by virtually all the major manufacturers. Passenger car brakes have 3 to 5 times more horsepower than the engines. This is why 60 to 0 mph happens in much less time than 0 to 60mph. Personally testing numerous cars has shown that from 50 mph, if one jams on both brake and throttle pedals, the vehicle stops. This includes one inadvertently conducted test when my winter boot caught the edge of the throttle pedal as I braked my fairly small car approaching a stop sign. In that case, as in all but two of the tests I've intentionally conducted, the car came to a dead stop despite protest from the engine. The stopping distance was sometimes increased, but the vehicles stopped. One exception was an exemplar import sedan I tested which experienced severe front brake fade. When the transmission down-shifted to first at 25mph or so, the engine revved near to redline, and was able to hold the speed steady. This test was stopped due to excessive heat buildup in the pads, but the conclusion was that the driver had most probably double pedalled, the front brakes had faded rapidly, the engine had continued to pull hard but the rear (dead axle) had locked up. This explained the set of (rear) skidmarks overlapping the evidence that the front wheels were pulling as the car crossed a grassy median. This is but one of many cases which disappeared off my radar years ago, and the final outcome of which (if any was reached) is unknown to me. Another exception involved a large SUV which had reportedly "revved up a little bit" partway through a stop as the woman braked while approaching a stop light. This increased her stopping distance enough that she gently rear-ended the car ahead of her. I tested the vehicle's response to double-pedalling on a secluded roadway, and found that the big V-8 coupled with the automatic transmission was able to drag the vehicle along at 25 miles per hour despite my greatest efforts to depress the brake pedal. The arrangement of the pedals was such that the brake pedal was higher than the throttle when not applied, but could easily be depressed enough to allow a misplaced shoe to contact both pedals. The driver was adamant that the engine had NOT roared to life, but rather seemed to rev slightly, which was consistent with her having had a foot slightly overlapping the throttle pedal as she braked. Most S/A cases I've had were "from a stop" in which "the car just roared to life and took off," which is the most commonly reported scenario. Usually, the driver is sure they were on the brake, but the car just kept going. "The harder I pressed on the brake pedal the faster it went." Yes, I have actually had people say that to me. Sometimes they say the shifter jumped into gear, as well. I've never found a problem with the brakes, the shifter, or the throttle in any of these cars, but not for lack of trying. Though I often cannot dispute the possibility of transient electrical gremlins having engaged the cruise unexpectedly (on vehicles so equipped), a firmly planted left foot should be able to stop pretty much any car, unless there is a brake problem. Some reports on this issue have come from Automotive News (May 15, 2000, which is no longer accessible online to non-subscribers) and a Feb 10, 2000, MSNBC News article (which is also no longer available online, sadly). The primary pundit in these articles was Mr. Sero (http://www.forensicfacts.com/SARV.html), who averred that the cruise control servos in some pre-1995 Fords have the potential to pull the throttle wide open as a result of one loose wire and one shorted wire, among other possible scenarios. If the brake-pedal travel switch (or dump valve) is not functional, then brake application won't release the cruise. Mr. Sero has admitted that he has never actually found a car that had done this, but simply that his analysis showed it was possible. Some (but not all) courts have opined that his theories meet the Daubert standard, and have allowed him to testify (http://www.daubertontheweb.com/Engineers.htm). So far, I haven't seen this problem either, but there are reports that Ford has told service technicians who call in with a sudden acceleration problem to check these wires for nicks or damage. This is certainly something to keep in mind when investigating such an allegation. Verifying that wires are tight, clean, and in good condition, and that the brake-pedal switch functions as intended should allow an investigator to either support or refute the existence of this problem. The March 1994 issue of the Accident Reconstruction Journal contains an article titled "Tire Mark Analysis in a Case of Unintended Acceleration," in which the authors concluded that the evidence showed the offending vehicle had accelerated very hard out of a parking space, followed in short order by a period of braking and acceleration, followed by a period of pure braking, at the end of which the car struck a tree. In addition to the possibility that the driver simply depressed both pedals, there may have been a mechanical problem: The Porsche had a recall campaign to correct a clutch-cable-bracket failure which could prevent the complete return of the acclerator pedal. The authors of the article were not retained to examine the mechanical aspects of the matter, but concluded that a double-pedal-type event (which may have been engendered by the recall problem) would be required to make the marks made by the car. This sort of incident should be considered a "stuck throttle" matter in my opinion, and is not the same as the sudden acceleration claims noted above. Another issue to consider in cases where the vehicle was initially at a stop in PARK is the brake-interlock switch which is becoming more and more common on passenger cars, but is by no means ubiquitous at this point. This switch prevents a vehicle from being shifted into gear unless the brake (or the clutch in manual-transmission cars) is depressed. When these switches are working they prevent simple pedal error, which seems to certainly be the most common cause of "unanticipated acceleration". If the vehicle is equipped with such an interlock, an additional simultaneous malfunction is required to allow the vehicle to take off after the engine roars to life. *Sudden-acceleration complaints per 100,000 vehicles. Vehicles studied were 1985-93 Ford Motor Co. models. Source: NHTSA, found in pages 25026 through 25037 of the April 28, 2000, issue of the Federal Register, which can be found online at www.access.gpo.gov. Audi effectively solved their S/A problem many years ago by installing brake-interlocks on all their vehicles. Jeep now offers to retrofit interlocks on vehicles they built if the owner wants one, as an answer to the recent spate of S/A problems reported about their trucks. And as the accompanying table shows, reports of S/A in these three Ford vehicles exhibit a definite trend after installation of interlocks. 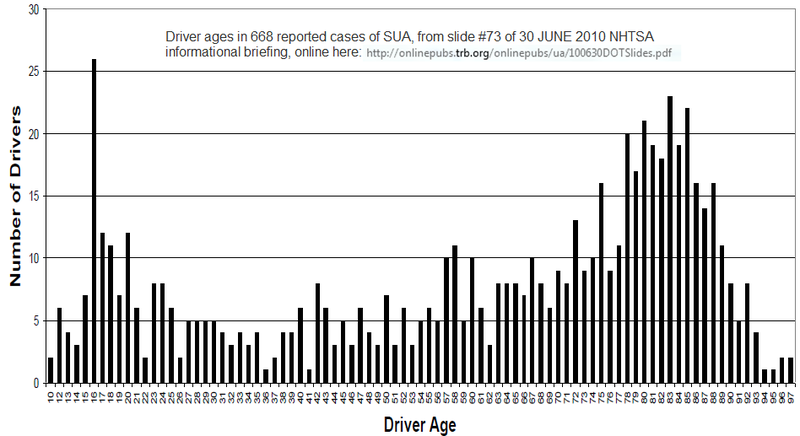 Castelli's book (see citation below) averrs that the cruise control was altered significantly in the same time frame as the interlock was installed, so the sudden change in S/A stats noted in the chart above may well be due to the C/C alterations which was NOT addressed by the NHTSA researchers. I haven't been able to verify this claim so far. The brake/shifter interlocks generally only work if the transmission is placed in park. In one case I handled, the owner left the car in neutral, with the keys in the ignition. A child, who was too short to depress the brake pedal, started the car and was able to move the selector from NEUTRAL to DRIVE, hitting someone working in front of the car. In another case I handled, an elderly patient who was not mentally stable and was somewhat violent apparently pulled the shifter into reverse while flailing around as the attendant driver was trying to come around the car to help her out. If you don't put the transmission lever all the way into park, there is a possibility of the transmission jumping out of the never-never land between PARK and REVERSE and rolling away. This is not a sudden acceleration issue, but an inadvertent movement issue, and I'm not addressing that topic here, really. As testimony that such things can potentially happen, I have been advised that JEEP recently sent this notice detailing "How to Put the Vehicle in Park" to known owners of 1999-2004 Grand Cherokees. Here's one website that lambastes Daimlyer Chrysler over numerous issues, including their failing to include a brake-shift interlock on its minivans long after other makers had been installing them. Interestingly, the website's authors associate the deficiency only with the problem of a vehicle being shifted into gear by a child, not with S/A: http://www.daimlerchryslervehicleproblems.com/ (you have to scroll down the page a ways for this topic). Paul Sheridan, a former DCX employee, appears to be the main force behind the website. There are a variety of aftermarket components, including emergency vehicle light systems, remote car starters, and alarms, which can intrude on the operation of these interlocks, even if installed as directed. One such highly publicized case (Wall Street Journal, November 1, 1999, Page 1), in which a police van brake-light-flasher system effectively bypassed the brake interlock system, resulted in 2 deaths in Minnesota in 1999. In one case I handled, a remote starter system was installed in such a way that it bypassed the park-interlock switch altogether. When the operator left it in gear one day and subsequently started the car with the key fob, the vehicle took off across the parking lot. She was hurt attempting to stop the vehicle. a test of the cruise control system, if possible. As cars are fitted with more and more electrical componentry, the possibility for transient electrical problems that may go unidentified despite extensive post-accident testing looms larger. The recent inclusion of "black-box" data recorders in virtually all General Motors vehicles may go a long way towards answering the question of what went wrong after the fact. Two years ago, GM took the bold step of allowing *anyone* to purchase the tool necessary to collect this information. (See http://mfes.com/cdr.html for more info on this system). Hopefully, data recorder information will become more accessible to the aftermarket as time goes on, and perhaps they will record even more information than the vehicle speed, throttle position, brake light condition, and seatbelt condition now commonly available. I recently received a mail from a fellow who insisted that he had experienced a sudden acceleration event for no apparent reason while he was stopped and lightly holding the brake pedal. The result was his car's engine revving up 500 to 700 RPMs momentarily, which dragged him forward a car-length before he figured out what was going on and pressed a little more firmly on the brake pedal to stop the car. I explained to him that this was NOT a sudden acceleration as defined by NHTSA or myself (see above). Such engine idle speed changes can be commanded by the engine control module for a variety of reasons, and do not fall into the S/A catagory, as far as I'm concerned. The same writer indicated that after reading this article, "the assumption is your major clients are automotive manufacturers" and that "Perhaps a disclaimer of manufacturer clients would help smooth things for those that have these concerns also." Well, there is no such disclaimer here because the OEMs have never hired me.
. . . .After reading your article on sudden acceleration I thought you might be interested in the following: I have owned a Renault 20 with cruise control (in Europe) that would occasionally show sudden loss of power or full acceleration, even though the cruise control was not active. We never had an accident with it (by reacting promptly) and that car is long gone. Several inspections could not determine any failure however at some point a directive from Renault came to our maintenance garage, not publicized of course. This stated that a plastic sheet should be inserted between the two PCB's that were rear-facing each other. The clearance was not sufficient to avoid contact in all temperature/ humidity conditions. After the sheet was inserted we never experienced the problems again, which made perfect sense to me, as an engineer.
. . . .Thus I am certain that acceleration/deceleration problems of the sort you described have occurred at least in this case and were due to technical failure. However I do not know what make this cruise control box was (not a standard on the Renault 20) and if that make was also used in other brands (such as the famous Audi ?). I also am aware of a widely publicized case in The Netherlands where a celebrity had a fatal accident with an Opel claiming sudden acceleration (Opel Omega I believe). After realizing that cruise control boxes in different car brands might actually be of the same make I always wondered if that car had the same make in it as the Renault 20. I could not find such information on the internet but my resources to this kind of information are limited of course.
. . . .I hope this is of interest to you, thanks for your attention and with best regards, M.S. A social constructionist approach to crisis management: Allegations of sudden acceleration in the Audi 5000 Article about the Audi debacle, with mention of Mr. Rosenbluth's involvement in making a transmission do what it was not capable of on its own 'long around page 11. Interesting. Denial of Motor Vehicle Defect Petition, DP99-004 Federal Register: April 28, 2000 (Volume 65, Number 83)], Page 25026-25037; deals with a Ford SUA, but reviews the '98 Pollard and Sussman report in some depth. As of this writing (03JAN2008) you can CLICK HERE for about 82 NHTSA petitions and such which mention the '89 Pollard Sussman report, including numerous petitions filed by attorneys representing someone hurt by a vehicle which experienced SUA. Obviously, this page was written before the current dust-up about Toyota's electronic systems. Though the furor has not changed the physics any, it has created a huge body of literature on S/A in general. In June, NHTSA held a "Briefing" on the topic, and much of the info from that event is available online now. The chart below comes from the powerpoint slides. My favorite part is that there are apparently 2 reports of Sudden Acceleration involving drivers UNDER TWELVE YEARS OLD. Things that make ya go Hmmmmmmm. "Pedal error and misperceived centerline in eight different automobiles," Vernoy & Tomerlin, Human Factors, Vol 31, No 4, p. 369.